Synthetic peptide within Human EAAT1 aa 150-250. The exact sequence is proprietary. Mouse brain, rat brain and human cerebellum lysates. Human brain tissue. Our Abpromise guarantee covers the use of ab181036 in the following tested applications. IHC-P 1/50 - 1/1000. Perform heat mediated antigen retrieval with citrate buffer pH 6 before commencing with IHC staining protocol. WB 1/1000 - 1/10000. Predicted molecular weight: 59 kDa. ab181036 staining EAAT1 in rat cerebral cortex tissue sections by Immunohistochemistry (IHC-P - paraformaldehyde-fixed, paraffin-embedded sections). Tissue was fixed with paraformaldehyde and antigen retrieval was by heat mediation in a EDTA buffer. Samples were incubated with primary antibody at a dilution of 1/1000. A goat anti-rabbit IgG H&L (HRP) ab97051 was used as the secondary antibody at 1/500. ab181036 staining EAAT1 in mouse cerebral cortex tissue sections by Immunohistochemistry (IHC-P - paraformaldehyde-fixed, paraffin-embedded sections). Tissue was fixed with paraformaldehyde and antigen retrieval was by heat mediation in a EDTA buffer. Samples were incubated with primary antibody at a dilution of 1/1000. A goat anti-rabbit IgG H&L (HRP) ab97051 was used as the secondary antibody at 1/500. ab181036 staining EAAT1 in human glioma tissue sections by Immunohistochemistry (IHC-P - paraformaldehyde-fixed, paraffin-embedded sections). Tissue was fixed with paraformaldehyde and antigen retrieval was by heat mediation in a EDTA buffer. Samples were incubated with primary antibody at a dilution of 1/1000. A goat anti-rabbit IgG H&L (HRP) ab97051 was used as the secondary antibody at 1/500. ab181036 staining EAAT1 in human cerebral cortex tissue sections by Immunohistochemistry (IHC-P - paraformaldehyde-fixed, paraffin-embedded sections). Tissue was fixed with paraformaldehyde and antigen retrieval was by heat mediation in a EDTA buffer. Samples were incubated with primary antibody at a dilution of 1/1000. A goat anti-rabbit IgG H&L (HRP) ab97051 was used as the secondary antibody at 1/500. 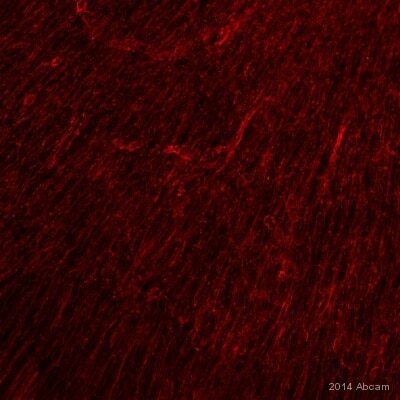 ab181036 staining EAAT1 in monkey brain tissue sections by Immunohistochemistry (PFA perfusion fixed frozen sections). Tissue samples were fixed by perfusion with paraformaldehyde, blocked with 10% serum at 24°C and antigen retrieval was by heat mediation in 10mM citrate acid + 0.05% Tween 20. The sample was incubated with primary antibody (1/100 in 2% donkey buffer) at 24°C for 13 hours. An Alexa Fluor® 647-conjugated donkey anti-rabbit polyclonal (1/100) was used as the secondary antibody. Immunohistochemical staining of EAAT1 in paraffin-embedded human brain tissue using ab181036 at a 1/50 dilution. Publishing research using ab181036? Please let us know so that we can cite the reference in this datasheet.